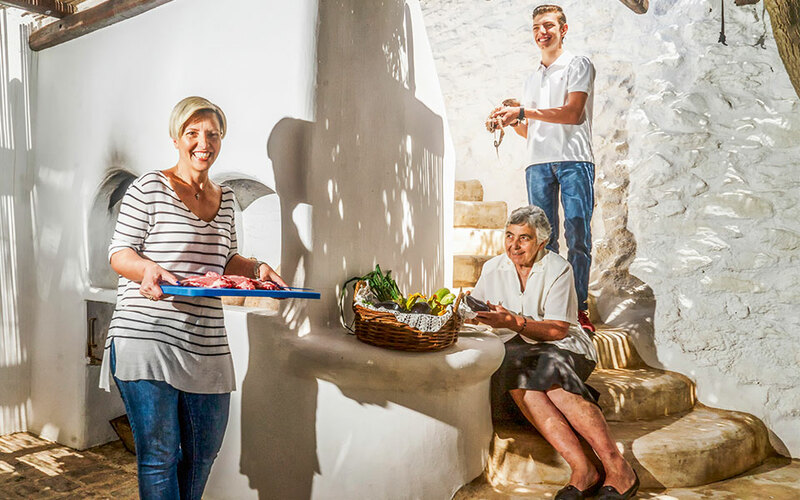 Irini Zouganeli (left) isn’t just a traditional cook, she also prepares food professionally for vacationers staying in summer houses on the island, often with the help of her mother, Eliza Zouganeli, and her son, Yiannis Dantou. There are still Mykonian households that produce the raw materials for their dinner tables and pass on traditional recipes from generation to generation. When the last of the summer visitors leave the island around late October, life can return to its normal pace and Mykonos to its residents: to the families of farmers and fishermen who form the backbone of the local community and maintain the island’s traditions. I was recently welcomed into the home of one such family. Yiannis Dantos, his mother, Irini Zouganeli, and his grandmother Eliza – all born and raised on Mykonos – talk to me about life in the past, what the younger generations have been given to work with and how they will fare in the future. I ask what survives of Mykonian culinary heritage. Eliza, the grandmother, is a typical Mykonian farmer and housewife. She makes her own cheeses, including tyrovolia – among the best on the island – and xinotyro, with milk from the family’s animals, brought in by her husband, Yiannis Zouganelis – a farmer, builder and president of the local community council for the past three years. The meals she cooks for her family are made with seasonal vegetables and fruit grown in her garden. On the previous day, she had made briam, a hearty vegetable casserole with potatoes, tomatoes, zucchini, eggplants and onions. 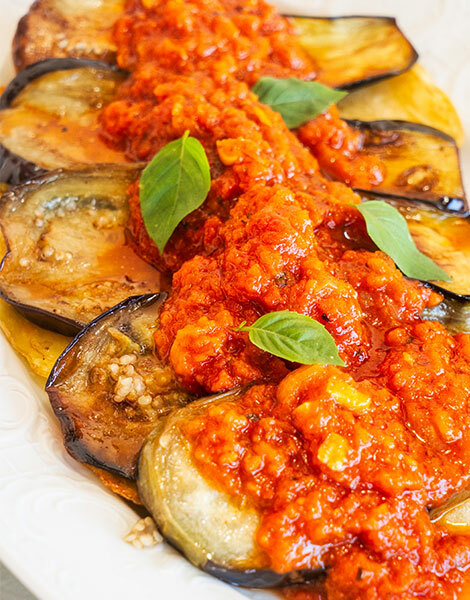 On the day of my visit, she prepared a classic summer dish: fried eggplants with a rich sauce of ripe tomatoes and lots of garlic. Everything is home-grown, and this is how it still is for many families. When the garden yields zucchinis, she boils them and serves them, sometimes with a couple of eggs (boiled or fried) from her henhouse, and skordalia, a garlic and potato mash. Later, when the green beans come into season, she cooks them in a tomato sauce with potatoes, occasionally adding a bit of lard (from the family’s pigs) for extra flavor. She also stocks the fruit preserves known as spoon sweets: quince, fig, grape and rose hip. “Everyone at home goes crazy for my goodies,” she says, “but it’s also my pleasure to share my knowledge.” She knows, for instance, when the snails will come out (with the first rains of October) and where to find the mushrooms and wild greens that she uses in her kitchen. She was taught all this long ago by her own grandmother and mother, and now in turn she’s passing this knowledge on to her daughter Irini. Irini runs a catering business and gives traditional cooking classes; she’s also been running the Mykonos Gastronomy Club, an initiative started by and aimed at passionate home cooks, for the past four years. “We’re trying to bring the community back together around a cooking pot and a table, exploring our old recipes and experimenting with dishes from other parts of the world as well,” she says. I, too, have fond memories connected with food. I remember how, in years gone by, grandmothers would make cheese with milk from the animals their husbands raised. I remember mothers preparing the best fried eggs ever, with a rich tomato sauce for extra flavor. I can still smell the herbs from our garden that my own mother used to put in the sausages she made. I can still taste the sea salt we used to collect from the rocks along the shore. 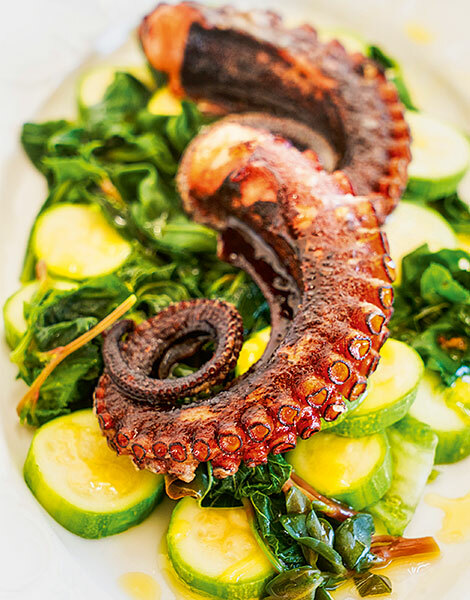 This is our Mykonos, and we invite you to taste it, too.